My rooms are currently devoid of any interactable environment. Sure, there are mobs, but that’s no enough. There is an occasional chest, but they are far and few, so they can’t fill out rooms. I am still to adjust exact room layouts and shapes, but even that won’t add any “content”. Besides, there is no gameplay with completely static stuff. 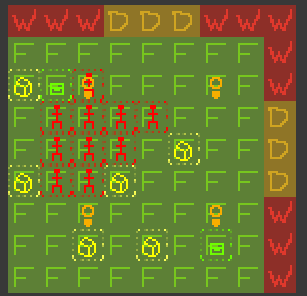 My thinking goes: red for explosions, blue for EMP discharge, green for toxic sludge. I’d love to add some appropriate effects too — fire, electricity, toxic spill. Furthermore, make environment catch fire or flood with sludge. And have mobs get zapped, slowed down, set on fire. But all of this is very… time-dependent. I might not get to it. For now, they will all just explode. 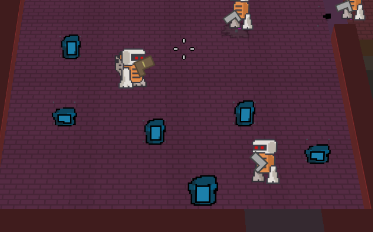 The explosion also need to hit both enemies and the player. 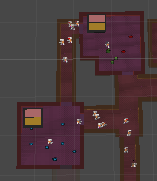 This basically adds gameplay; I think it’s pretty obvious what sort of stuff this results in. Oh boy, is this a mess! I can’t even remember how I am supposed to set up the distribution numbers or what they mean and how the group designation is supposed to affect it. I remember it all being very smart and fancy and totally over the top now that I look at it. I will have to fix it shortly. Yay! 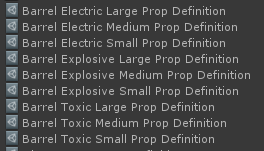 This is pretty awesome, as I have been missing actual props in the levels. Now I just have to balance these and place them in reasonable locations in the rooms. “Just”. Finally, back to my content assets. 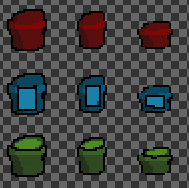 Firstly, I will reuse the same asset for all levels and not have to make 8 separate ones that all need changes individually. I can’t be defining stuff I want this tediously. In fact, my loot chest now actually spawn properly in cubbies and arenas, since before this then needed weird distribution numbers to ever appear. I can now specify as many combination as I need, since they are much easier to add and maintain. 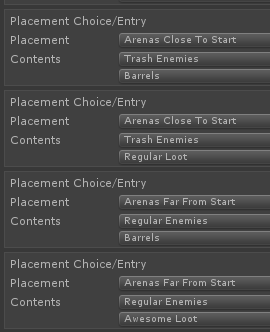 I might add additional stuff for balancing later, like level ranges in which different combinations are available, thematic variations, or some such.